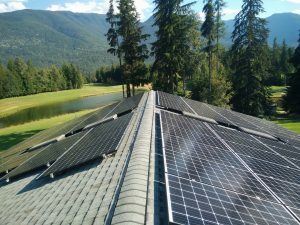 In the month of July 2018, Dandelion Renewables installed community solar systems near Nelson, British Columbia. We built three solar PV systems on community buildings in Balfour, BC, near Nelson, with a combined solar capacity of 67KW DC. These three projects complement Nelson Hydro’s own 60KW DC community solar garden project that was built to showcase a potential for solar virtual net-metering in 2017. Three community-owned buildings include Balfour Community Hall, Balfour Senior’s Center, and Balfour Golf Club. To contain the power costs, the three buildings have undergone detailed energy assessments and retrofits beginning in 2014. Today in all three buildings the temperature is maintained by efficient air-source heat pumps. Solar panels on the Balfour Golf Course. The ultimate goal of solar is to cover the power consumption of the building. For example, the power that is used on a hot summer day when air-source pumps are cooling down the buildings. The summer operation of the golf course and the building electric loads fits well with solar production. As solar power generation is an intermittent resource and does not exactly follow the load profile, the excess solar energy will be exported to the Nelson Hydro grid for a credit. 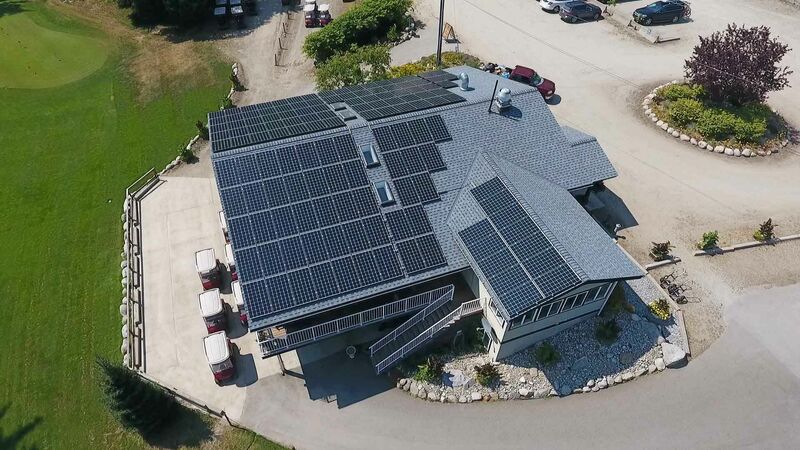 By generating their own electricity and selling the excess solar energy back to the Nelson Hydro grid, the communities buildings will offset their power bill costs and in the long run, will reduce their operating costs. Current electricity rates and pricing structure in the area around Nelson create a compelling solar business case for the distributed solar generation. Another benefit of residential and commercial-scale solar systems is that they are installed close to where the energy is consumed, thus they rely less on the distribution system. The Regional District of Central Kootenay successfully managed to secure funding from the Columbia Trust Basin and the Federal Tax Community Works Fund, which made these three community solar systems near Nelson possible. Nelson is the only city in western Canada with its own hydroelectric generation and distribution plant making power for 2c/kWh(from the Hydro manager) and selling for an average of 12c/kWh(res. + comm. avg). Any solar panel installed in a NH area with public money eliminates the profits otherwise earned from their hydroelectric power helping to reduce hydro rates. Balfour residents buy Nelson hydro power. Presently Nelson Hydro pays full retail for this solar power while losing the income from otherwise cleaner greener waterpower now spilling down the river. So tax dollars paid for this, residents lose the income otherwise earned from waterpower while paying full retail for solar power! Would you call this absurd? I do. Hi Norm, thank you for your honest opinion about financial viability of solar in your area. You correctly mentioned a large difference in the hydro energy generation cost and the sale price. It would be fantastic for Nelson Hydro, which is City-owned, to capture that whole difference as a profit. However, the most of the difference covers the energy delivery costs, maintaining the distribution system and ancillary services. Roof-top solar systems that we installed are located at the point of the energy consumption. Their primary function is to offset the buildings own power consumption first. At certain times, these systems will generate more energy than the buildings can consume. Under the existing Nelson Hydro net-metering regulation, that excess of solar will be sold at the retail rate to the grid. The exported generation will be consumed by the next neighbour on the line, so that minor amount of excess energy barely uses the existing distribution system. The energy generated at the point of consumption is called distributed generation. Due to delivery charges that are built-in into the consumers rate, distributed generation has a higher value than the energy generated by the utility located further away from the load. Also, there is a positive impact to the area from the generation source diversification. If you consider the costs of building a new hydro plant, compared to the dropping costs for solar PV, the value of solar will become more apparent. Currently solar generation is not widely utilized in the Nelson area. Keeping the current Nelson Hydro net-meeting framework is detrimental for solar PV deployment in the Nelson area. In the long run, solar energy, being the diversified, distributed and one of the cheapest source of new generation capacity will help to improve reliability of the entire electric system and to lower the consumer power rates. Last, but not the least is that we employed and trained one local person on the installations, while the community organizations employed a local project manager. The Nelson hydro bylaw states 25kWp at any one location. You installed 40kW? The other bidder Skyfire clearly stated they would install 25kW at that location to meet the bylaw. Was this oversight or a sneaky way to sell more solar panels, use more public money and cause Nelson hydro customers to pay even more for excess solar sent to the grid when we make power in our own hydroelectric plant and a huge profit now gone. I will try and stop nelson hydro from paying full retail for ANY Balfour phoney feelgood greenwashing solar power wasting our public money. According to 6.4 of the City of Nelson bylaws, Independent Power Producers projects fell in two categories 0-25KW or 25KW-250KW of rated capacity per project. I assume you refer to the golf course site, which has two services. We have connected 12KW AC or 20KW DC of solar per service, which is less than 25 KW of rated capacity regardless if the solar “rated capacity” is defined as KW AC or KW DC. Please note that solar projects over 25KW and less than 250KW are also permitted by Nelson Hydro. If Balfour Golf project would fall in to this larger project group, we would just need to negotiate the terms with Nelson Hydro specific to this project. Based on our experience, electric utilities more often refer to KW AC as the solar PV system rated capacity. If you could confirm that with Nelson Hydro and provide that information here in this blog, it will be much appreciated. Insanity, Nelson hydro is owned by the public. Yet some misinformed greenwasher gets public grant money to put solar panels on public buildings for their warm fuzzy feeling while clean green water that should make power and a huge profit in our own hydroelectric plant spills down the river with the profits. Solar only works in summer when our reservoirs are full, we don’t need it, in winter when we could use help, solar doesn’t work, its worthless! Let me ask you if your electricity is free in the summer? Distributed generation that is located right where it is consumed is very valuable. Given that Balfour Golf Course operates in the summer, it greatly matched the profile of the solar generation. On a larger utility scale, I agree with you, solar profile could present interesting challenges. Nobody will answer my questions at Nelson hydro. The bylaw clearly states anyone installing over 25kWp solar needs special authorization, the Balfour GC is 40kW divided between two meters. Cleverly your on line monitoring only shows 24.8kW for the GC? The public media info suggests this was installed for about $2/watt. Impossible!! The truth is begining to come out. Fortis’s application for public solar in Kelowna was DENIED by the BCUC as of NO benefit to anyone. The BC Retired persons submission to this showed it was purely a risk and expense taken by ratepayers, also it said there was no GHG benefit, solar is not GREEN here although the solar sales mantra always says it is. The SMA solar inverters installed are rated for 6.2KW (max usable DC power) each and we have total 4 of them installed in the Balfour golf course. Thus, the combined rated capacity for the two systems is determined as 24.8KW. Norm, just noted that Stanfield and Barnes are posting from the same IP address as you are. Are you guys sharing the same household or attending the same public library? Regardless, I am encouraging you to provide more comments and your thoughts. Also Norm, I just came across your blog about BC solar scam. Can you allow me to contribute to your blog, the same as I welcome your input to our blog? I promise, I will not input too much, as I do not have much time to spare between the family and running the solar business. One point in your blog I certainly would like to touch on, is calling us as an AB company. Please note that have 3 people working for us and residing in BC. Projects like Balfour and many other allow us to have more and more local BC resources to work on these projects. I strongly support you in bringing local resources for BC solar projects. You may note there is little benefit in treating these Kootenay solar trolls with anything but the back of your hand (metaphorically speaking). Falling cost margins and the benefits of localized, distributed generation, along with other facts and benefits, make little to no difference to these sentence-mangling, solar-hating “gentlemen”. Norm Yanke I’ll be seeing you. Just read this, so where can we meet Randolph? I would be more than happy to discuss what is going on here, because there is a LOT more than meets the eye that needs explanation. Hi Randolph, thank you very much for your input and support. I agree with you that distributed generation, whether it is solar or biomass or small hydro has a great future potential. I just returned from Solar Power International where I was amazed on how quickly the storage technology develops as well. “Solar trolls” huh? Name calling is the last refuge of those trying to maintain a weak position. The correct response to critical comments is honest appraisal followed by appropriate counter information, not fake indignation.